Children from the community of Migron came with their parents this morning, Sunday, to protest outside the Prime Minister’s Office, instead of attending school as the school year commences. 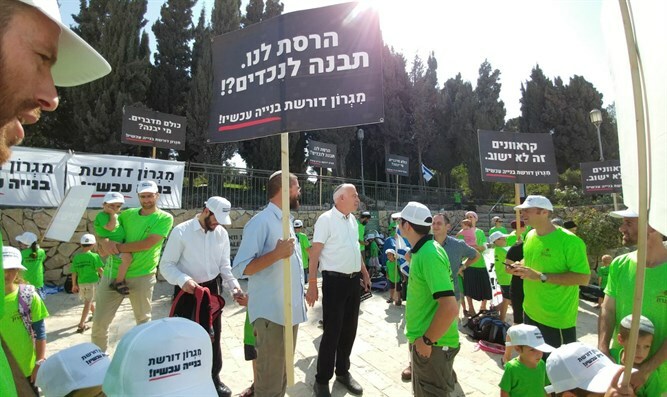 The children and their parents are calling on the Prime Minister and government ministers gathering for the cabinet meeting today to fulfill their commitment to Migron residents 5 years ago to build a permanent community for them at the “Yekev” site north of Jerusalem near Kochav Yaakov. "Netanyahu evicted us five years ago, promising that within two years he would build us a permanent community. We have been living for five years in caravans in inhumane conditions waiting for the prime minister to fulfill his promise."